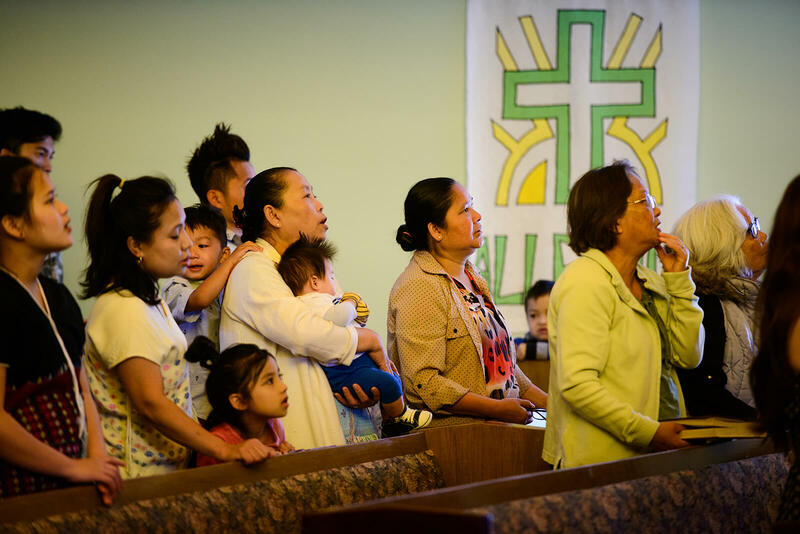 From Washington State to Indiana, the Church is caring for Burmese refugees. The Church cares for the Body of Christ across the country. 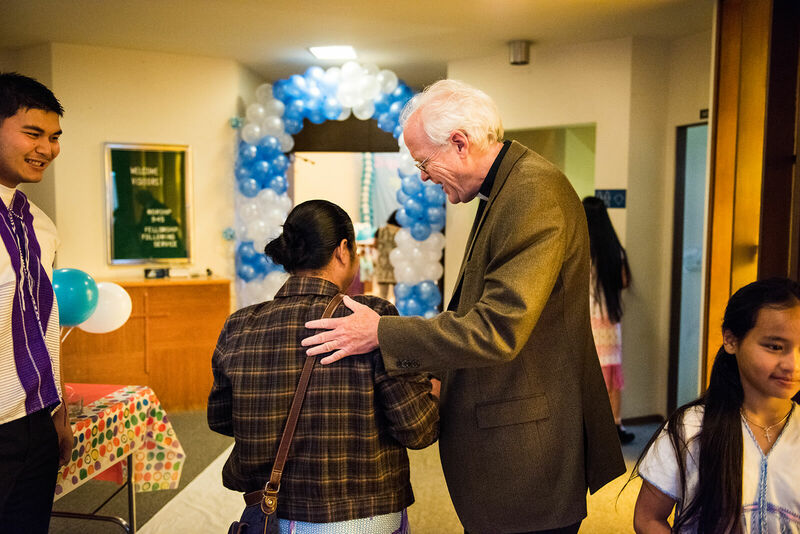 Even in unexpected locations, pastors and congregation members, old and young, extend love to new refugees and immigrants from different cultures. 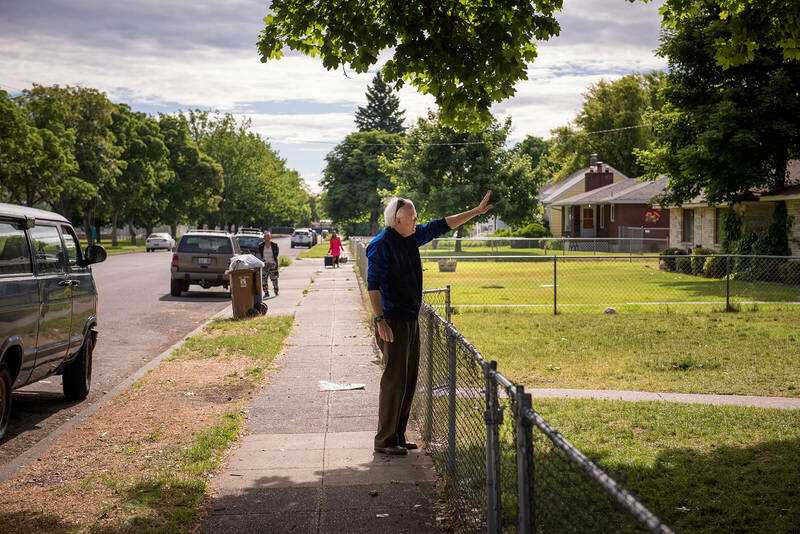 In Spokane, Wash., a city in the Northwest known for its funky roadside drive-through coffee shops and outdoor vibe, refugees from the Karen people of Burma and Thailand have resettled in the area after fleeing foreign refugee camps. The Karen are one of many groups of culturally and linguistically diverse people in Burma — also known as Myanmar — a country of golden Buddhist pagodas and diverse vegetation. The Rev. Doug Wagley, pastor of New Vision Lutheran Church, welcomes guests to a Karen Burmese wedding at the church in June. At New Vision Lutheran Church in Spokane, volunteers were busy on a cool Friday afternoon in June hanging pink and blue decorations for Saturday’s wedding of Ler Moo and his bride, July Paw. Volunteers hung a sign near the altar that read “Happy Wedding Ceremony,” as another volunteer built a giant frame of balloons for the church narthex. In the midst of the activity, the Rev. Doug Wagley, pastor of the church, greeted guests and church members. He’s at home with ethnic ministry, since he first worked with Vietnamese refugees and immigrants before the Burmese started arriving in the area in 2006. Wagley said visitors are welcomed to the church because their language has been incorporated into the Divine Service. “We use Karen (and sometime Burmese) as well as Vietnamese in our services. We have the confessions and creeds and prayers from the catechism in their language. We also do Scripture readings in various languages,” said Wagley. 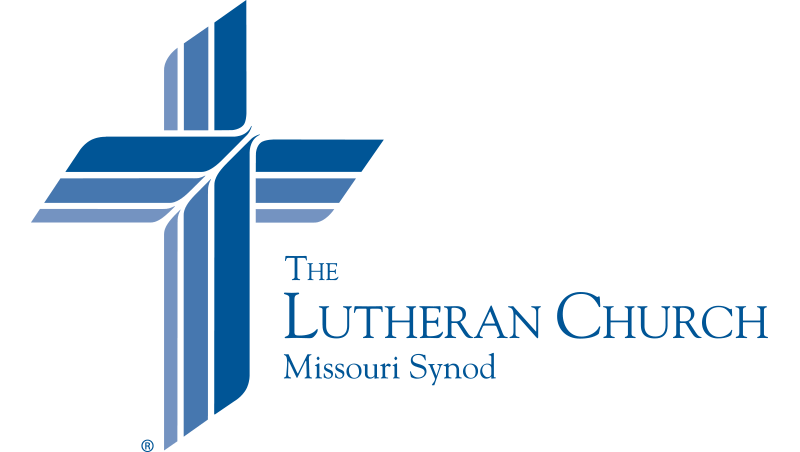 Most of the refugees who are already Christian come from Roman Catholic, Anglican or Baptist backgrounds due to the denominational mission work in Burma, said Wagley, but he has found that they are open to Lutheran doctrine on the Word and the Lord’s Supper. One challenge he encounters is working through culturally appropriate ways of teaching to talk to the older generations — especially those with a Baptist background — about Baptism for children. They learned from the Baptist church that no one can be baptized until they understand the teaching, which is usually considered to happen at age 18. Culturally, the parents are reticent to disagree with a pastor, which is a challenge as Wagley seeks to obey the Fourth Commandment and encourage Baptism. Wagley said the Burmese children often ask their parents for permission to be baptized by Wagley after receiving years of catechetical instruction. Later, Wagley visited old and new friends at their homes. It’s not uncommon for him to spend several hours meeting with families over traditional food and tea. He’s bold to speak about Jesus and witness, but he also uses this time to build relationships. “They have to trust you,” he said, noting that he majored in Asian studies and loves the varied cultures he gets to work with. The Spokane refugee community accepts him as one of their own. That’s why Wagley knows that even though it can be overwhelming at times, he’s called by God both to care for his flock in Word and Sacrament ministry and also to serve as a resource for day-to-day tasks. The morning before the wedding, Wagley’s phone rang at 6 a.m. Some Burmese friends were locked out of their car with the engine running. “They don’t know what the phonebook is or who to call,” he said. Wagley told them to call a locksmith, but they didn’t know what that was. “Pastor, can you call one for us?” they asked. Later at the wedding, Burmese culture was on full display. The women in the wedding party wore traditional blue and white dresses with multicolored fringe and an intricate detailing of pink and red patterns. The men wore white jackets and black pants, with blue trim and teal ties. They sang, they prayed and they wed. Afterward, guests talked over traditional food: noodles with a sharp cilantro bite and grilled goat and rice. 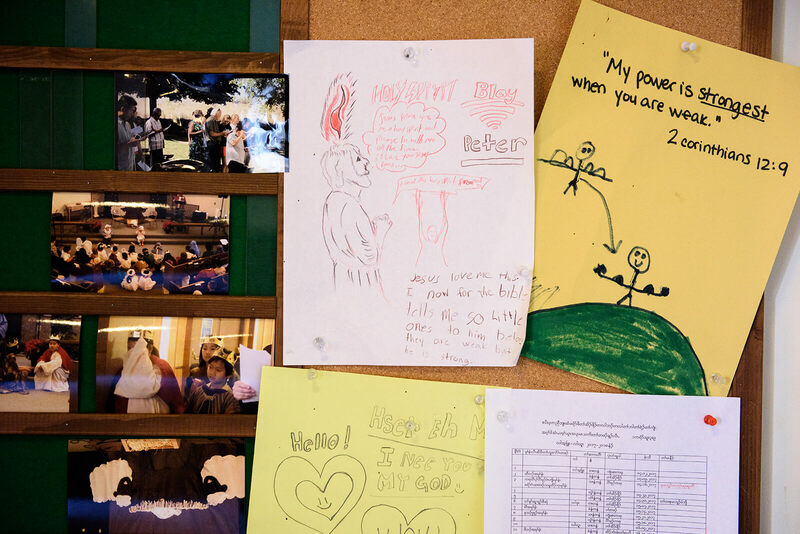 “One of the most important things was to have a loving congregation that reached out and greeted them on Sundays and got involved in their lives and children’s lives and took them to appointments during the week,” said Wagley. The other crucial part of the ministry is transportation. “We still give lots of rides to the refugees to church and back. The motto is ‘you pick them up, they will come!’ The greatest step, though, is to teach our long-term members to invite people into their own homes for meals and activities and to practice Asian hospitality ourselves. This is definitely reciprocal!” he continued. The Rev. Doug Wagley picks up church members for worship on a Sunday in June. A few weeks later in another part of the country, Soe Moe hunkers down on his belly with a gaggle of young children piled on his back on a hot and sunny day at Camp Lutherhaven in rural Albion, Ind. In a rush of water, the giggling group careens down a waterslide to the bottom of a muddy hill. 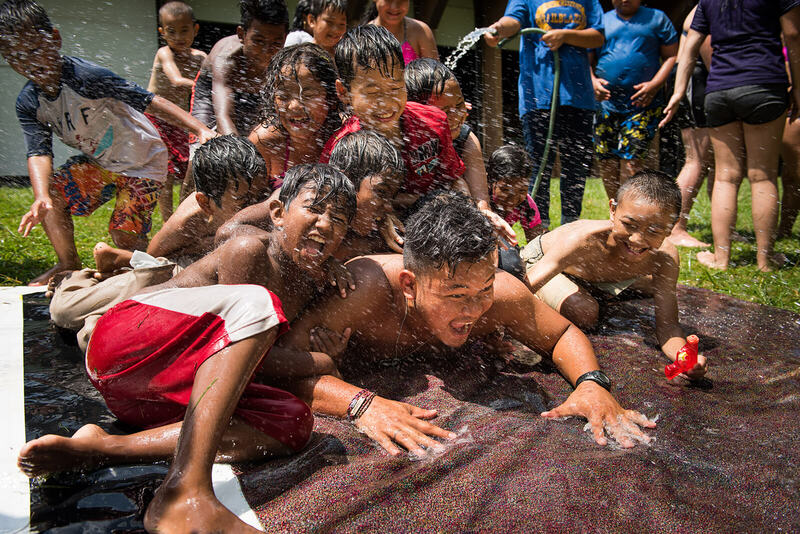 Moe, known as “Chief” to the campers, is a young man who came from Thailand as a Karen refugee. He arrived in the United States in 2008. Moe was raised as a Christian and discovered that he wanted to serve the Lord after seeing his cousin attract children to Jesus through guitar music in their refugee camp. He volunteered to serve as a camp counselor for the week because he loves the children and the work of All Nations Outreach — a program led by the Rev. Jim Keller, pastor of a Burmese congregation at nearby New Life Lutheran Church in Fort Wayne. 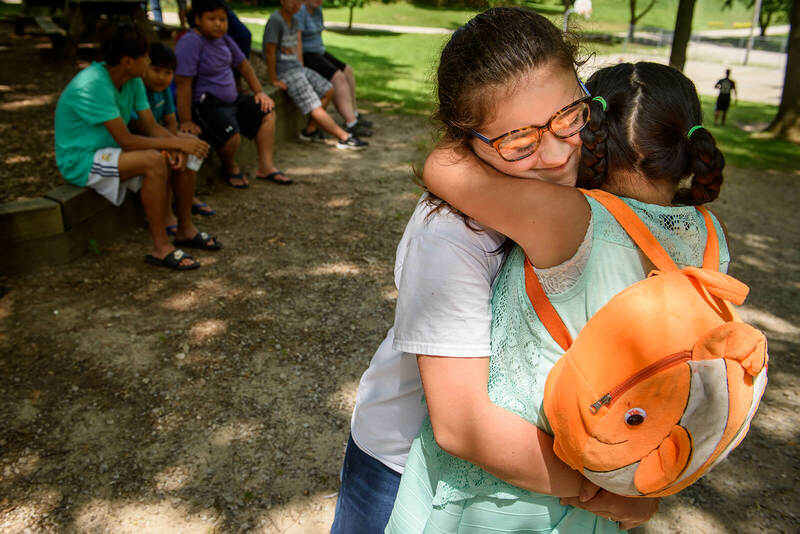 All Nations Outreach’s day camp stems from a friendship resource help center led by Keller at a Fort Wayne apartment complex that is home to Burmese refugees. Keller buses the children up to the camp each summer. His goal is to provide a camp-like experience for unchurched kids where they can also hear about Jesus. On one day, he lamented a decision by a local Muslim imam in Fort Wayne who forbade a group of children from attending the weeklong program. But through God’s work, other non-Christian children came. He also cares for refugees through the center by helping with day-to-day tasks and driving them to appointments. Top: Connor Kriete from Alive in Christ Lutheran Church, Columbia, Mo., high-fives children during a boating activity. Center: Friends enjoy fellowship at Camp Lutherhaven in rural Albion, Ind. Bottom: Faith Jonas of Alive in Christ hugs a Burmese camper. “Our overall goal is we want all these people in heaven, and this is one of the best places to come to meet Jesus,” said Keller. The pastor wore a T-shirt and floppy-brimmed hat that day as he watched a young girl slide awkwardly down the waterslide and crash into another group of children. He helped her up and made sure she was OK.
Moe, who is a member at Southwest Lutheran Church, Fort Wayne, is in the process of enrolling in the Ethnic Immigrant Institute of Theology program at Concordia Seminary, St. Louis. He wants to serve the church and help new refugee children. Earlier in the day, teenagers from Alive in Christ Lutheran Church, Columbia, Mo. 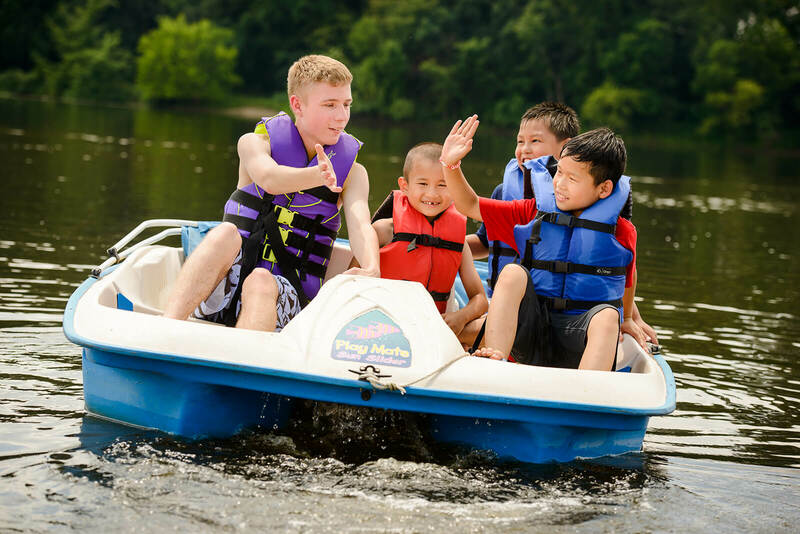 — who came on a mission trip to help with the camp at Lutherhaven — walked with the kids in the woods, boated on the lake, sang Christian songs and ate traditional food. Hot dogs and rice for some, fish soup for others. The children come by bus each day to spend time with the volunteers, who stay on the camp property. Before the kids headed back for the day, Keller led the group in a Bible story and prayer. Faith Jonas, a member of Alive in Christ, hugged her little companion as she saw her to the bus. 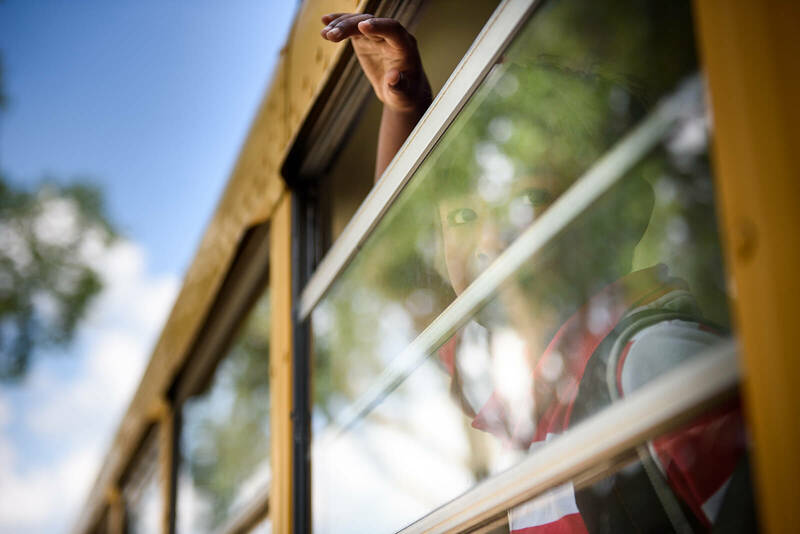 On board, children waved back as their bus kicked up a dirt cloud as it drove away. A boy waves to All Nations Outreach volunteers at Camp Lutherhaven following a day of activities together. The love extended to new refugees, under the cross of Christ and exemplified in the day-to-day assistance to someone new to our culture, is crucial to ministry. From Indiana to Spokane, the Church cares for this specific people group by bearing Christ’s love and mercy and bringing them into the family of faith. God, there are many refugees in our world today. May they find welcome and love in Your Church as they hear Your Word from Your people. Grant that we all may love and serve one another as Your Son loved and served in His earthly ministry. Give all people faith to find refuge in Your mercy and grace through Your Son, Jesus Christ, our Lord. Amen.